(The Root) — Japanese clothing label Mynority Classics memorializes some of hip-hop's biggest giants in its new set of novelty playing cards. 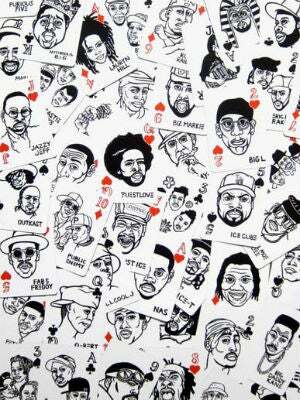 Each hip-hop heavyweight is hand-drawn onto each of the deck's 54 cards, which feature legends from Biz Markie, Public Enemy and Eric B. and Rakim to Jay-Z, Nas and Biggie. Tokyo-based artist Sayori Wada lends her talent to the one-of-a-kind card deck, using Japanese-style calligraphy pens to sketch the faces of famous hip-hop acts. While a deck will set you back a hefty $30, it's a great gift for hip-hop enthusiasts and card-playing aficionados alike. To learn more about Mynority Classics' hip-hop playing cards, and to get a hold of your own deck, visit the company's website. You can also check out a clip from the card decks' unique production below. Previous recommendation: South Africa's Bike Culture in Photos.